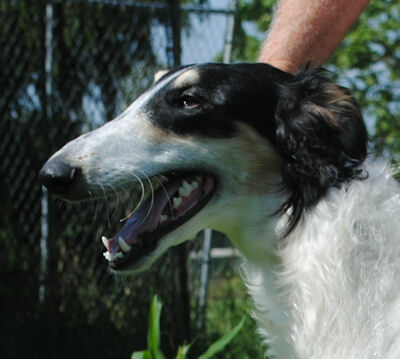 and " 2018 BCOA Versatility Winner"
April 6, 2019 Joe wins a point at AKC coursing. 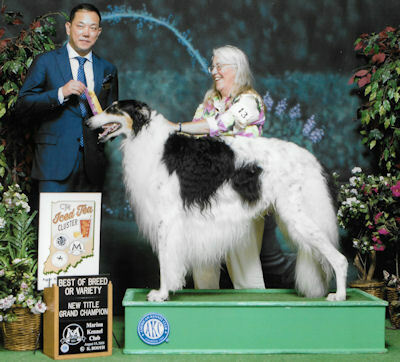 April 13, Joe ties for first place, but rather than running off the tie, we forfeited which still gave him the 1 point he needed to finish his AKC Field Championship. 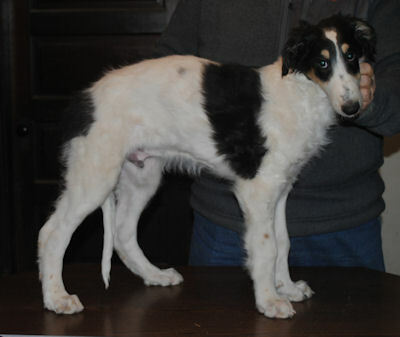 For 2018, Joe ended up ranked #9 in the country for AKC coursing, with 40 Bowen points. He only ran in 7 trials. He won the BCOA 2018 Versatility Award (for the second year in a row). 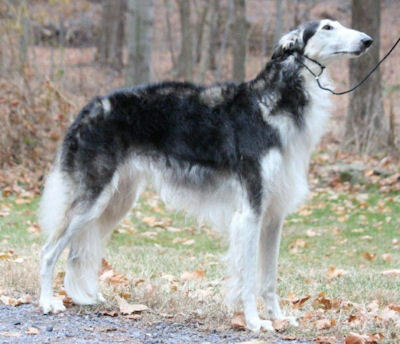 In the 2018 BCOA rankings, Joe was #4 in AKC lure coursing and #8 in novice obedience. August 25 & 26, 2018 Joe wins BOB both days at the OKIGO ASFA trials for a total of 20 points. September 8, 2018 Joe won 1 point at AKC lure coursing. September 15, 2018 Joe earns his first qualifying score for his Companion Dog (CD) title, with owner KC. 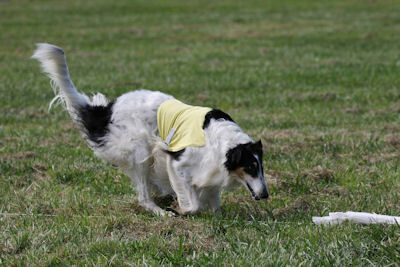 October 6, one point won at AKC lure coursing. 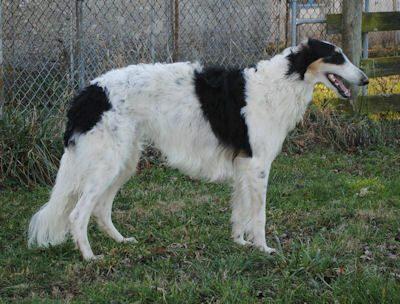 October 19 Joe earns his second qualifying score for his Companion Dog (CD) title. 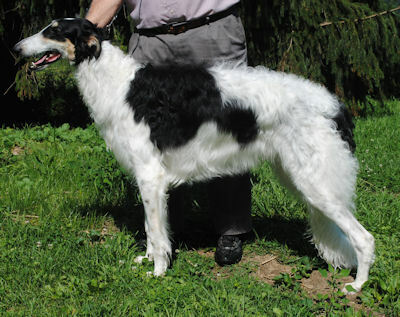 October 21, Joe wins third place in a stake of 10 open dogs for 2 points towards his AKC FC title. November 24, Joe finishes his ASFA Field Championship. 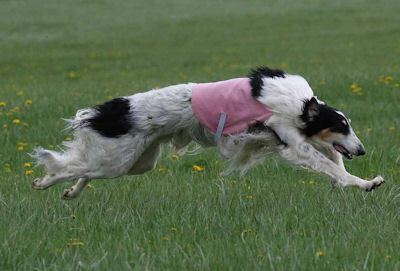 April 8, 2018, Joe won his 9th point at AKC coursing. 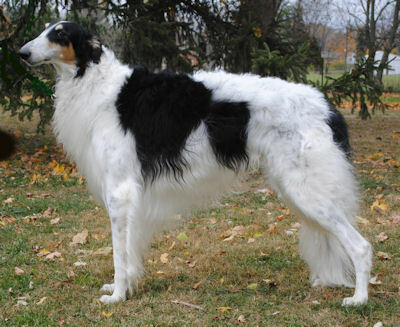 April 22, 2018, Joe won Best of Breed over 22 borzoi, including 3 specials for 5 GCH points at the Central Ohio show. 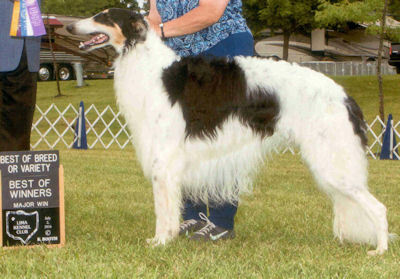 May 26, 2018, Joe won Select Dog for 1 point at the Warren County Ohio show. 3 more GCH points won June 16 & 17, 2018 at the Echo Hills shows. Joe finished his GCH title August 15, 2018, with Best of Breed (pictured below) at the Marion Indiana show He won 5 GCH majors and was always owner handled. Joe won his first GCH point September 18, 2016 owner handled. He won a 5 point GCH major February 11, 2017, owner handled. He earned his first Beginner Novice leg January 8, 2017. He got a 194 and first place in the class for his second Beginner Novice leg, February 26, 2017. April 8 & 9, 2017 Joe went to his first two AKC lure coursing trials, won first place in the open stake both days for a 3 point major and a 4 point major. April 16, 2017, Joe wins a first place in ASFA so now has all needed placements for his title as well as 41 points. Joe earned his Beginners Novice (BN) title at the BCOA specialty May 16, 2017 with a 190. June 3, 2017 Joe wins another point in AKC coursing. June 17 & 18, 2017, he won Best of Breed for a 5 point GCH major and a 4 point GCH major, owner handled. 8 ASFA points won August 19 and 6 ASFA points won September 2, giving him 55 points total. Joe earned his Senior Courser title October 6, 2017. Joe won 6 ASFA points November 25, 8 points December 16 and 8 points December 17, 2017, for a total of 77 ASFA points. (coursing pictures by Joe Stewart). 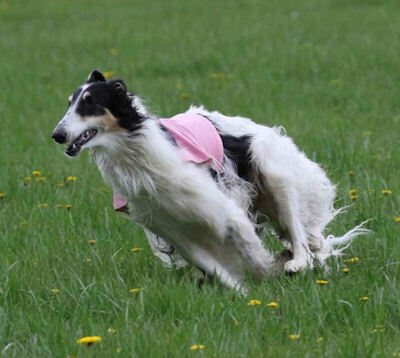 May 2016, first time at lure coursing, without practicing, Joe earned his Junior Courser title. Joe won 1 conformation point, May 1 2016. July 2, 2016, eighteen month old Joe won Best of Breed over 3 specials for his second 4 point major (pictured below). Joe won single conformation points August 1, August 21, August 31 and finished his conformation championship September 17,2016, all wins owner handled. Joe started his ASFA lure coursing career December 10, 2016 winning 9 points and a placement towards his ASFA Field Championship. He won 18 more ASFA points December 29 & 30, 2016. 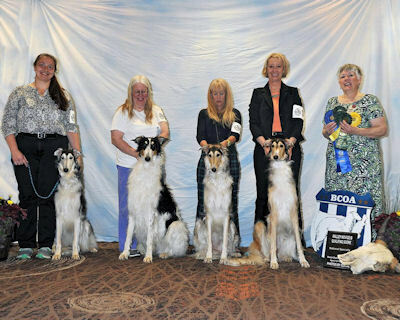 Joe finished his Rally Novice title at the BCOA National Specialty April 12, 2016 (pictured below with his litter sisters Whimsy and Colleen Allen, Joe with KC, Vivian with Wendy Merendini, Joy with Chris Danker and trophy presenter Joy Windle). Also at the National, Joe won first in his Futurity class, and fourth place in the 12 - 18 month regular dog class, owner handled. 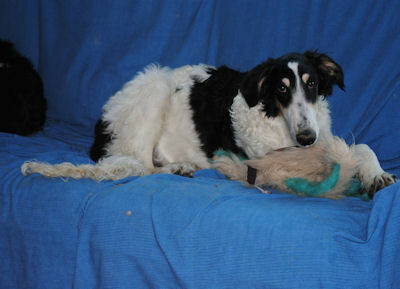 Joe is pictured below at 1 year old. 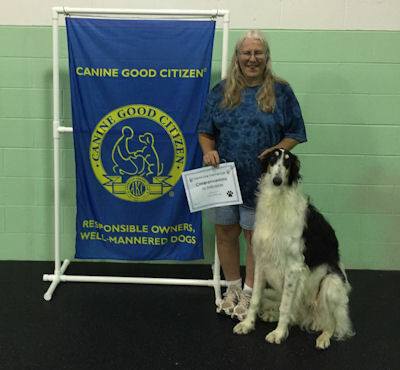 He earned his first point from the puppy class, September 20, 2015. 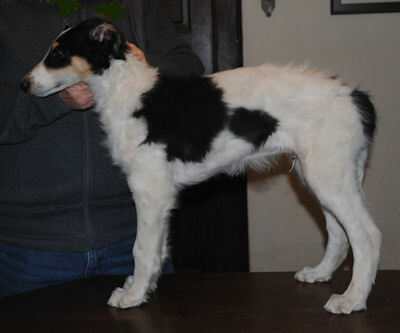 February 13, 2016 Joe won a 4 point major at 14 months old age, owner handled. February 21 & 27, 2016 Joe earned two rally novice legs. March 12 & 13, 2016 Joe won 2 more points in conformation. 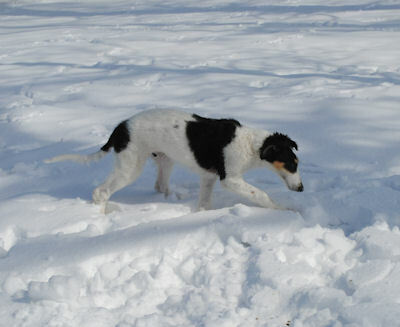 Joe is pictured above at 9 months old and below at 5 months. 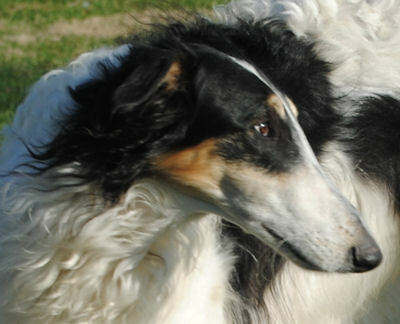 Littermates: CH Hemlock Hollow Aruzia Enjoy the Journey, RN, RA, NAJ, NJP "Joy"
GCH Hemlock Hollow Aruzia Journey Into Imagination, JC, CA "Pia"
CH Hemlock Hollow Aruzia Journey Towards Daylight, CA "Asleigh"
CH Hemlock Hollow Aruzia Journey Across Time, JC, SC, SCN, SIN "Sherlock"
CH Hemlock Hollow Journey To Rule Sixty Two, CGC, CGCA, RN, BN, JC, NA, NAJ, OA, OAJ, AX, AXJ,MXJ, MX, MXB, MJB, TKA, DJ "Whimsy"
CH Hemlock Hollow Aruzia The Journey Continues, JC "Archie"
GCH Hemlock Hollow Aruzia Desertwinds Journey, CGC, JC, RN, RA, RE, BN "Vivian"
Hemlock Hollow Aruzia Sentimental Journey, JC "Watson"
Hemlock Hollow Aruzia Enchanted Journey to JAG "Ella"
Home This page was last updated April 14, 2019 Â© 2019 Lorrie Scott. All Rights Reserved.